Anyway, back to the usual stuff. 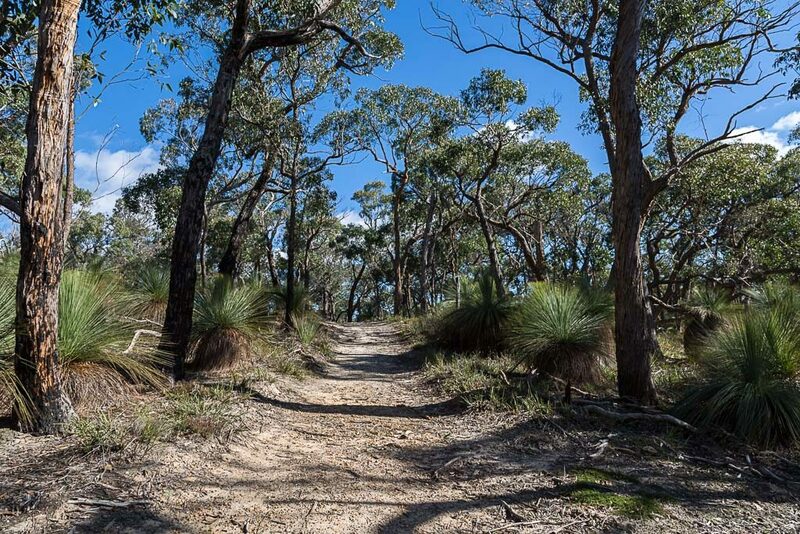 Boar Gully Camp to Little River Camp, Burchell Trail is the first day of this three day hike and at only 10 km in distance it’s certainly not the longest. 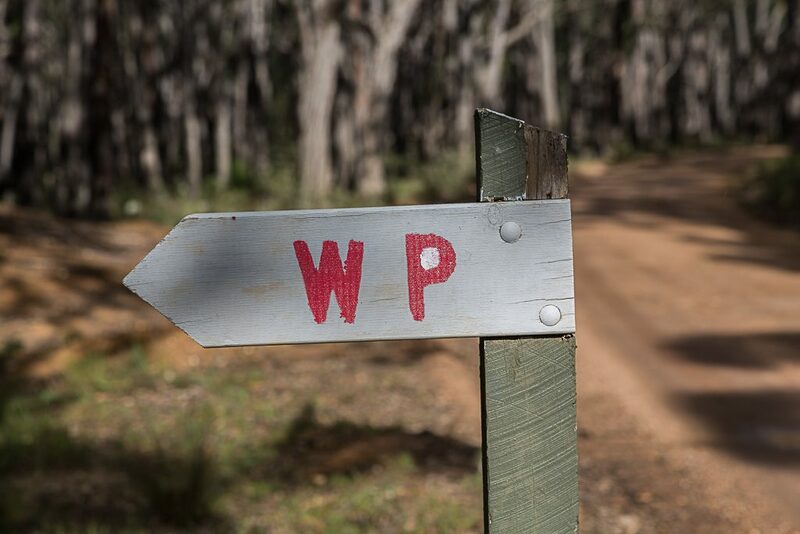 As the previous posts outlined, I’d left my car at Fridays Camp, which is at the end of the walk. 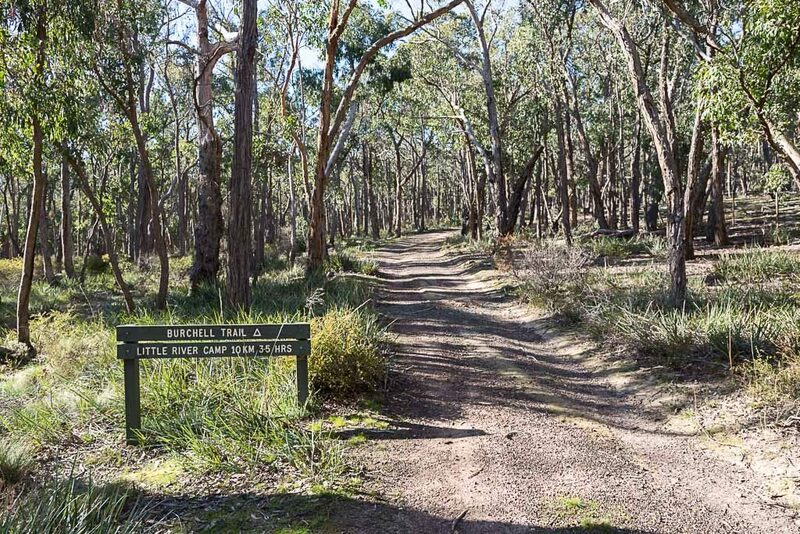 I then wandered a number of roads back to the official start at Boar Gully Camp. The Burchell Trail is a bit of a weird one. It’s described as three days of walking, but the first and last day are pretty short. At just over 10 km each, there was certainly going to be some down time. Sure, you could walk it all in two, but this would mean camping halfway out in the bush somewhere. I figured I had the time, so why not take it easy and use the official camps. 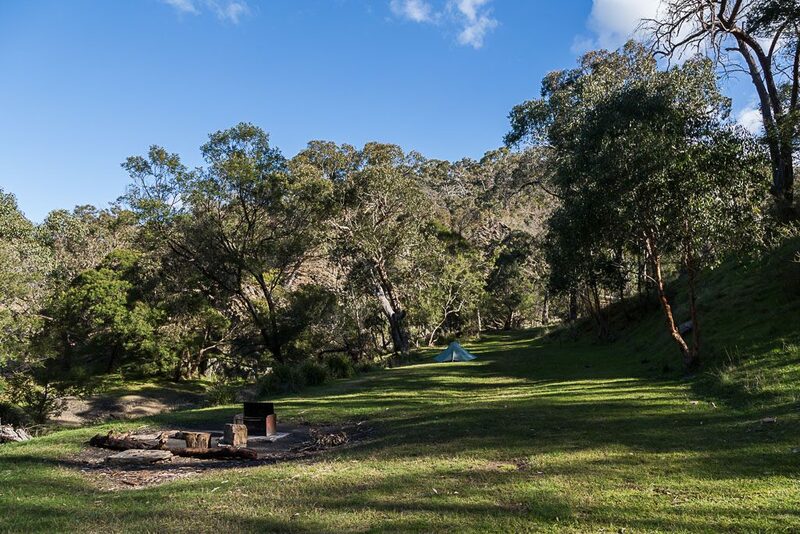 This is good in theory, but after wandering into Boar Gully Camp the previous day, I soon realised some extra preparation may have come in handy. What I needed was a book, as there were five hours of daylight to kill. Wondering what to do, I decided to put up the tent at a glacial speed. In slow motion I pottered around with it. When done, I checked my watch and realised I’d only used up 15 minutes. I was tempted to pack it up and then re-do it. Just for some practice. In the end, I abandoned any idea of being occupied and had a long afternoon siesta instead. Actually, this snooze lasted about 15 hours. The night at Boar Gully was a quiet one. No wind and clear skies meant it was pretty chilly. In the early hours of the morning, I was fighting a losing battle with condensation. No amount of opening the tent to help ventilation seemed to work. A breeze would have been handy, but alas it was completely still. At least the clear sky meant I’d have another calm, sunny day to contend with. The damp surroundings were also playing havoc with the comfort station, as the roof was getting its job description all arse-about. Instead of keeping water out, it allowed it to flood in. I needed a raincoat, as the cubicle had its own portable rain cloud happening. You can see the problem now, as it meant my strides were getting drenched. Being resourceful though, I went for an obvious solution. Ditch the pants. Yes, you read that right. Sans pants was the way to go. 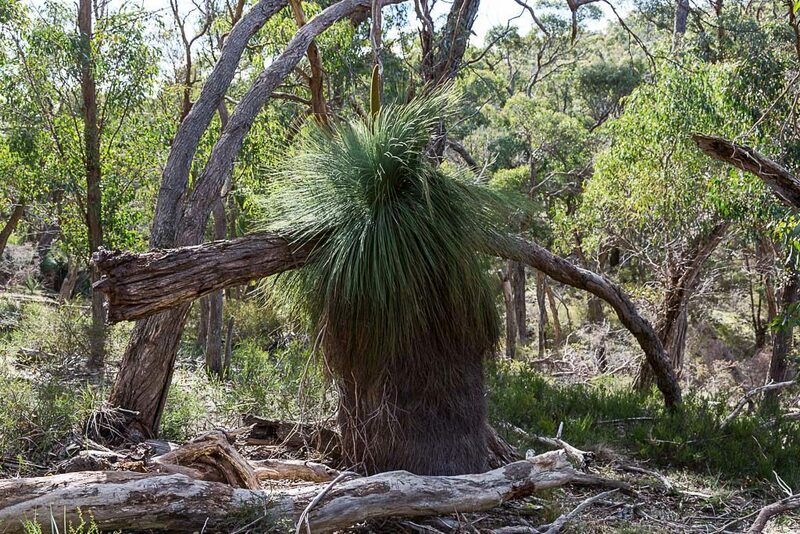 Sure, there may have been a problem if someone turned up, but I could have easily disguised myself as a grass tree and sneaked away. Really, this is what going into the bush is all about. Leaving the comforts of a warm house and a toasty bed. Out into the wilderness and confronting the forces of nature. Like condensation. It’s brutal out there. Anyway, I was purposely slow in getting going, as I knew the day was short. I wasn’t even guessing. I knew exactly how brief it would be, as I’d walked the opening leg twice in the past as day walks. 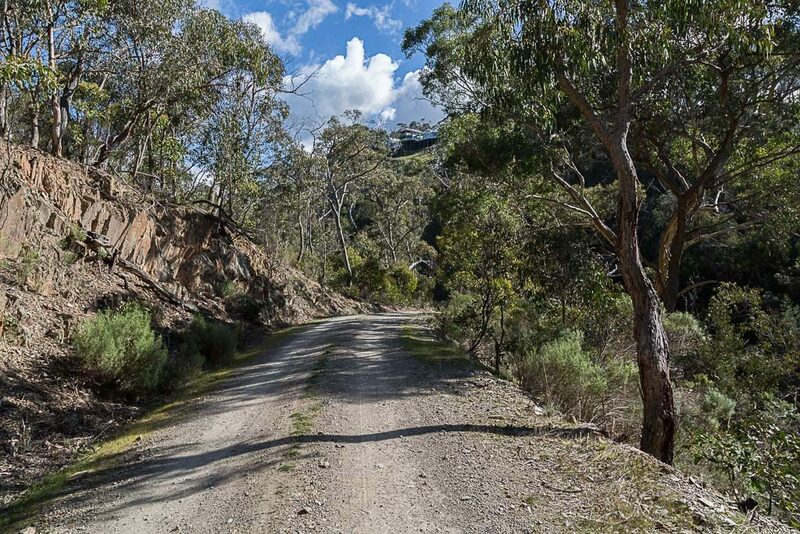 You’ll find it as walk number 5 in Glenn ‘Guru of Good Times’ Tempest’s book, Melbourne’s Western Gorges. He calls it the Grass Tree Walk. Is that a spoiler for what is to come? Then again, you may have twigged when you looked at the photo on the top of the page? Finally though, I threw on the pack and strolled to the official start line. 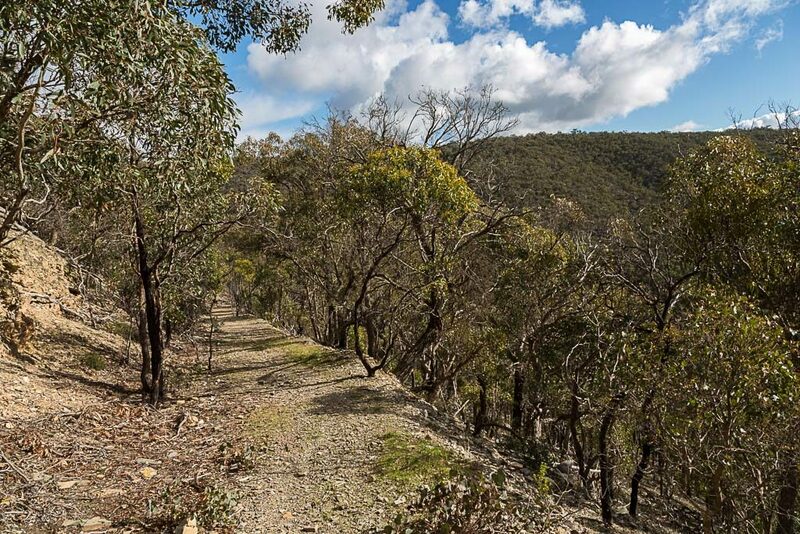 …the route swings into the bush. Actually, I’m always intrigued by big, blazing ‘keep out’ signs. Why do I want to go into their cleared farmland anyway? …but other than that, I don’t have a lot to show you. I seemed to have forgotten to take some photos. I guess I can throw in some from previous trips along these quiet tracks. 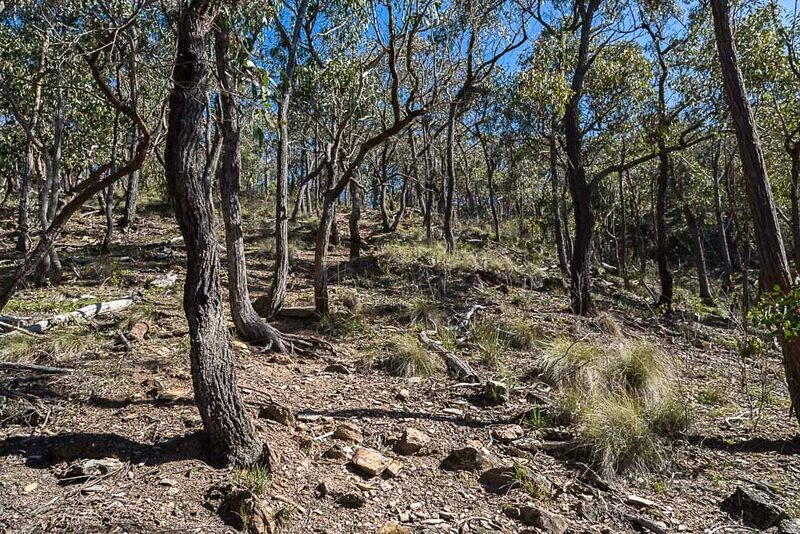 Back in 2012, I walked this section on a similar cloudless day. 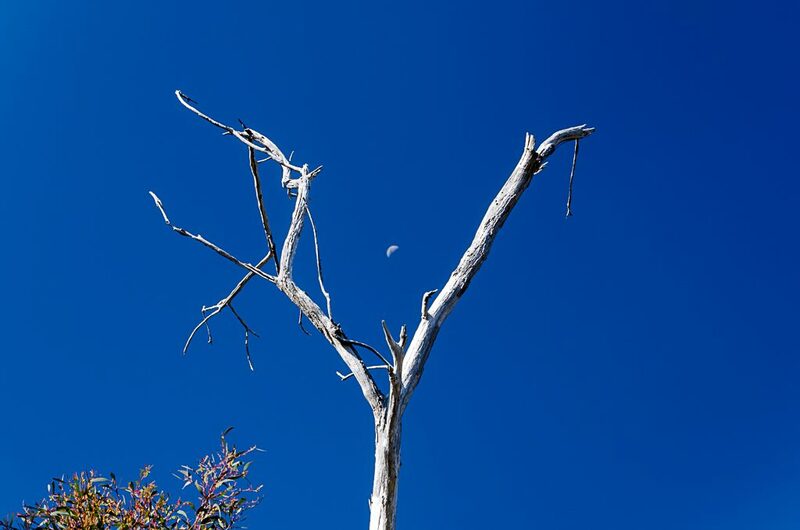 Complete with the moon. 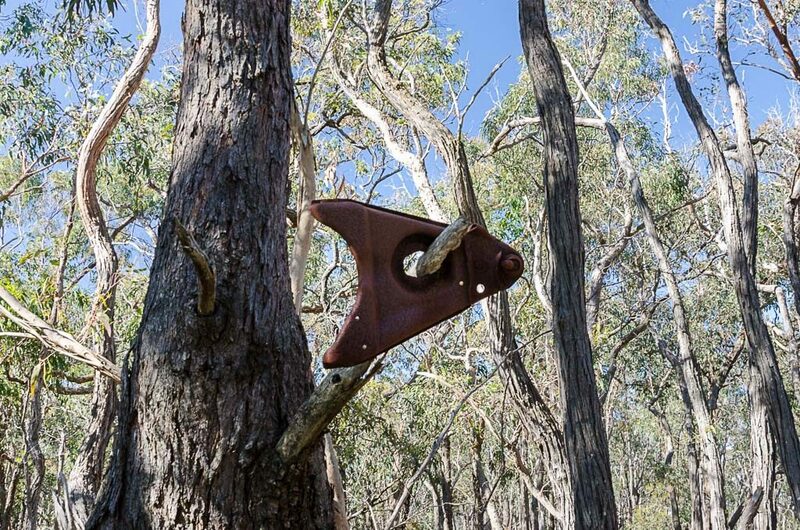 Back then, there was also some ye olde car parts, unceremoniously thrown into a tree. On this trip though, the metal had gone. 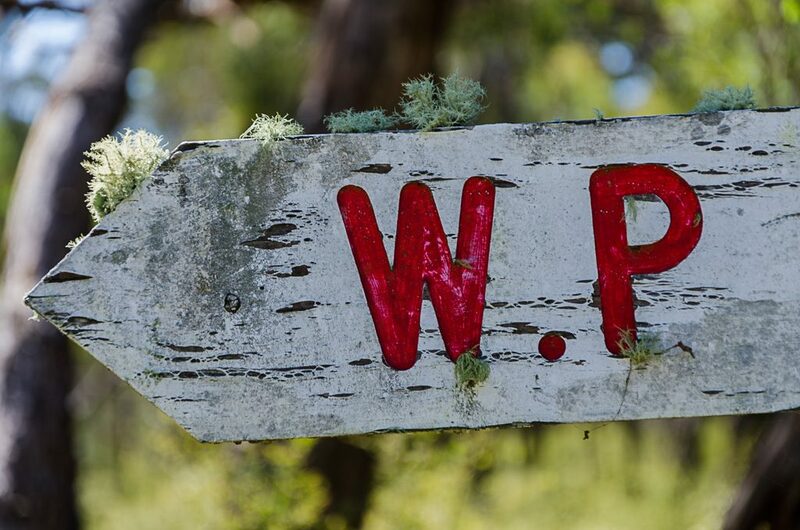 A regular photographic favourite are the moss covered Water Point signs. I do like some weathered timber. Like this one. Hang on, that’s the wrong photo. Being brand new, it’s a poor example of what I’m waffling about. Here. This is what I mean. Weather beaten timber is a concern for some people, but I think they’re taking things a bit far. 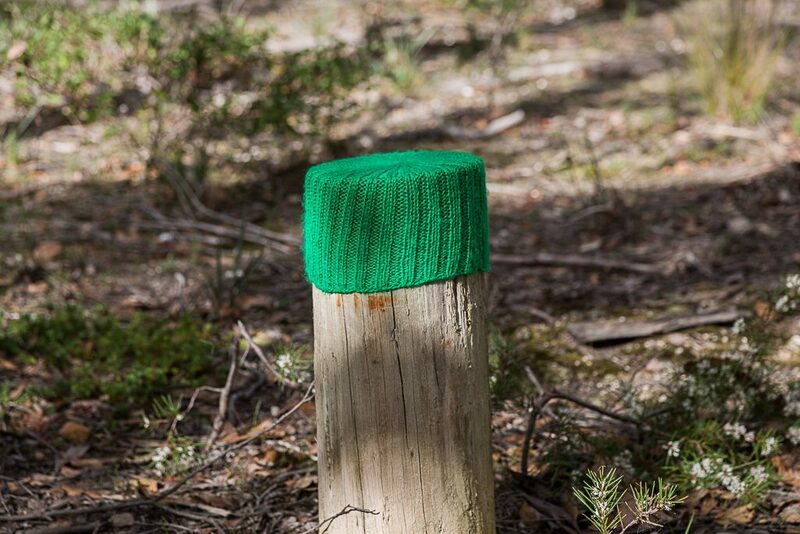 This post was equipped with its own beanie. Sure, there isn’t much happening, but the main feature of the day is coming up. A descent down into an old quarry. Mm… A walk into a machinery ravaged piece of landscape might not be the best drawcard, so I’m going to have to lift my game to sell it to you. Having walked it before, I knew what to expect. As a track follows a ridgeline, you’ll come to this rock. 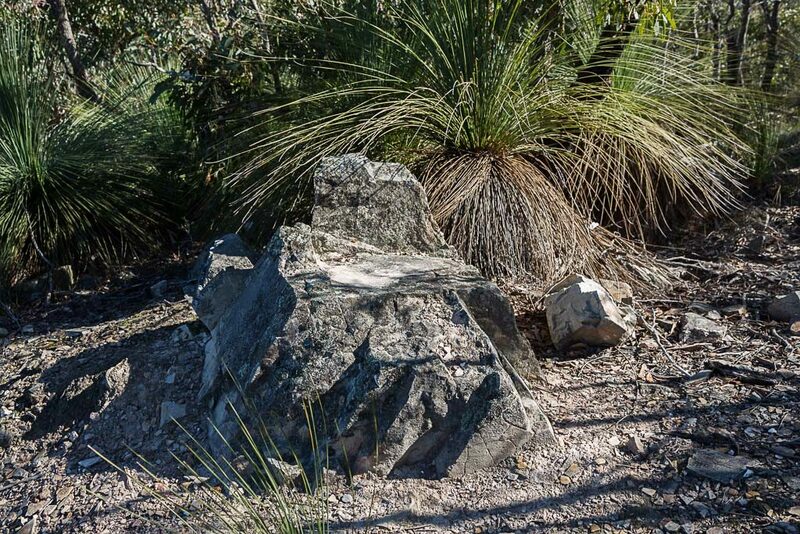 I think it’s the best rock-seat I’ve seen for a while. Knowing I was about to descend, I sat on this rock for about 20 minutes and soaked up the weak, winter sunshine. 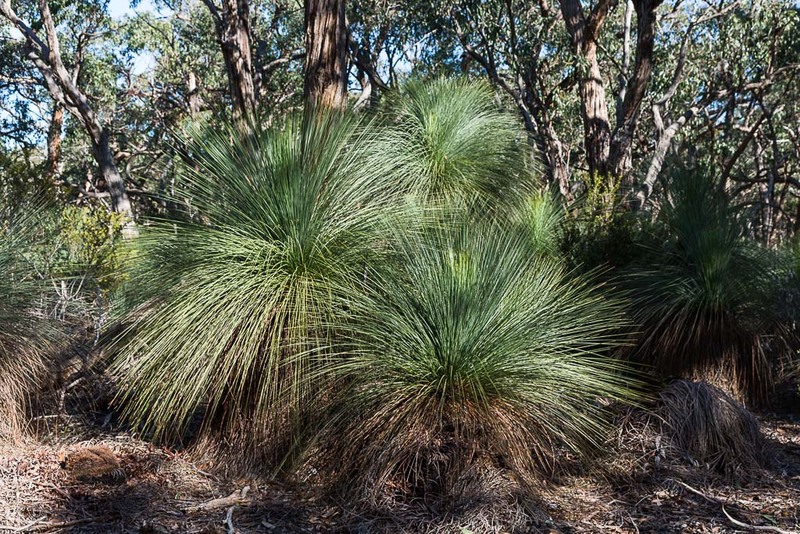 …passing multiple grass trees along the way. Later on, it’s interesting to see what I take photos of. 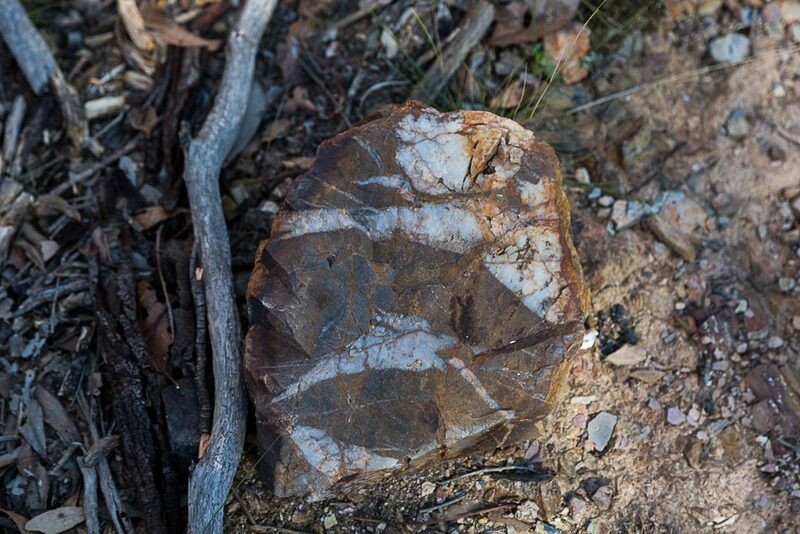 This rock caught my eye and without my glasses, its blurry markings looked like the profile of a person running. Viewing it now with my Coke bottles on, it’s not quite a sprinting figure. 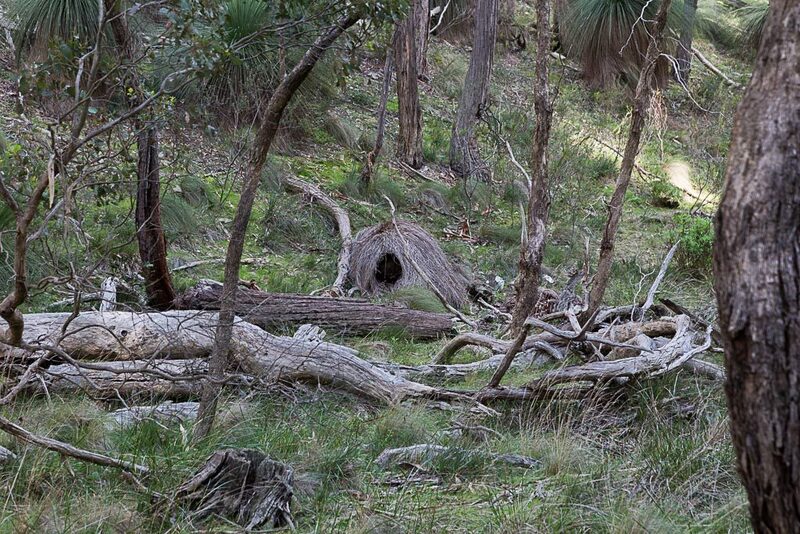 …except on closer inspection, it was a collapsed grass tree. 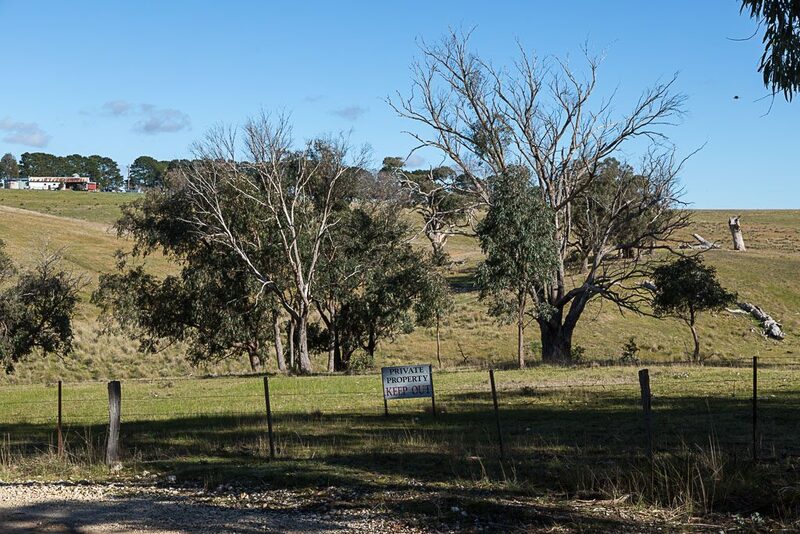 Unfortunately, for all the great grass trees in the area, there are plenty that have fallen victim to Phytophthora cinnamomi. I did all I could. I came into the hike with scrubbed boots and did the same when I’d finished. 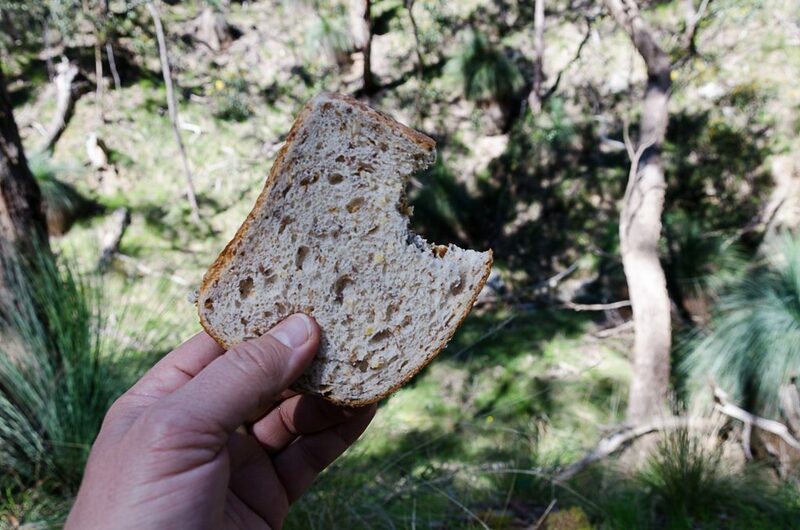 …and on previous occasions I’ve stopped at this spot for lunch. There’s a grass bank on the side of the creek, which is handy location to put the legs up and have something to eat. The creek is well-eroded, but I’ve never seen water in it. I’ve no idea what it takes for it to flow? On this occasion, I had no intention of stopping for food. Knowing the end of the day was only an hour or so away helped with that decision. What about the past though? 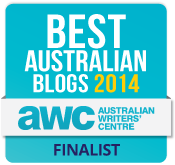 Oh, it was vegemite sandwiches. Moving on, I now faced the only hill of the day. On my first trip, the steep rise took me off-guard. I’m sure the somnambulant nature of the terrain previously walked had something to do with it. Sure, it’s not the highest hill or the steepest, but when I experienced it initially, I concluded it sucked. …and keeps going. On the second trip, I knew it was there, so wondered if it would feel any different. Mm… No. It still sucked. Okay, but what about on this occasion? Surely by the third visit it would be okay? Actually, it wasn’t too bad. No, I’m just joking. It sucked even more, as this time I was carrying a heavier pack. I was glad to reach the top and after this, I knew it would be plain sailing for the rest of the day. I popped out onto a road and I think someone was taking the piss with its name. This is McLeans Highway. I thought the word ‘road’ might be apt, but here they’ve gone full highway mode. Anyway, one interesting thought is I’d crossed McLeans Highway earlier before heading into the quarry. I’ve seen a report of the Burchell Trail online and they didn’t even go into the quarry. No, they went full steam ahead on the road and skipped it. Huh? Sure, it makes for an easier day, but if you miss it, then you’ll be at camp at around 10 am with about 27 hours of daylight to kill. What would you do to pass the time? I guess putting the tent up and choking the bishop might soak up some time. Well, that would take up 25 seconds and then what? 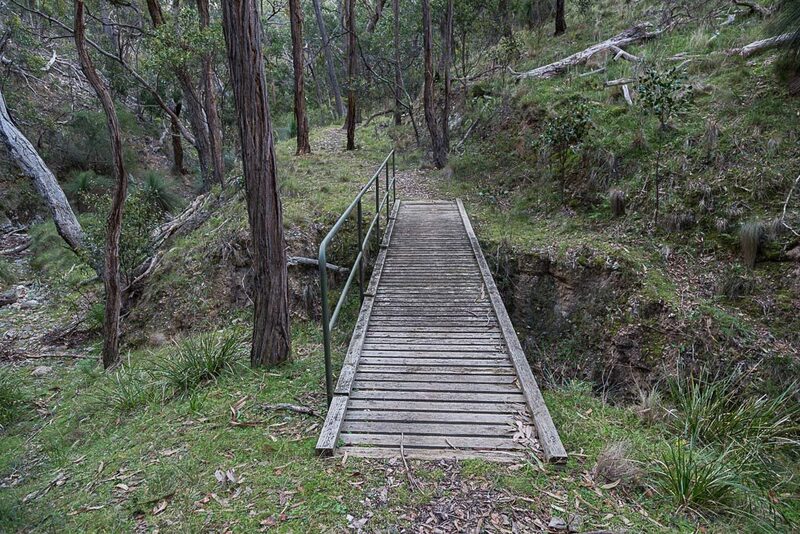 …before descending down to Little River Camp Ground. By the way, even though I was on a ‘highway’, it was quite tranquil. 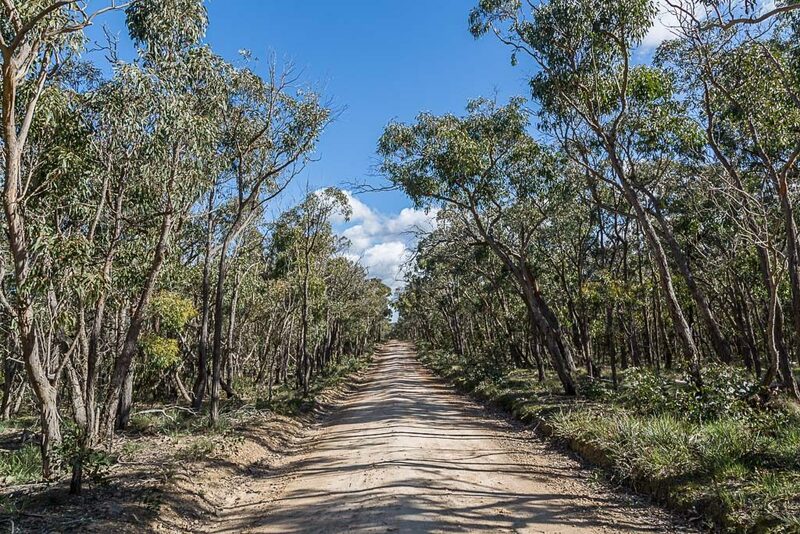 I hadn’t seen a car or person, so there was a feeling of remoteness. Well, until I saw the world’s largest house overlooking the area. It’s on the hill in the next photo. It’s so massive, I assumed it was something community related. Surely it can’t be someones home? I think it is though and it’s enormous. I’d sack the bloke who gave the planning permit for this one, as it doesn’t remotely attempt to blend in with the landscape. 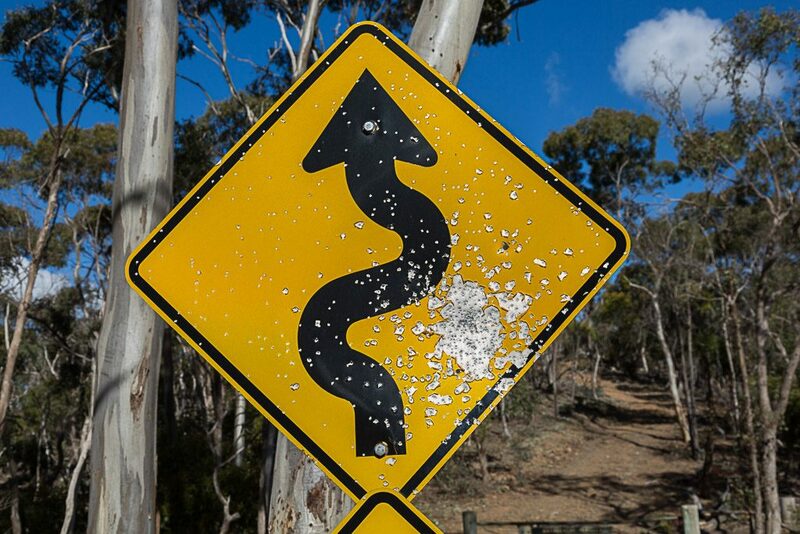 I passed some obligatory gunshot signs. You just know if you asked the bloke who did this he’d say he’s a responsible gun owner. Yeah, okay. A short distance further, I reached camp and my day was done. Now, even though I left late, I was still surprised by how early I’d finished for the day. Just looking at the GPS gave me an explanation. It wasn’t even 10 km in distance. Oh well, I certainly had all the time in the world to put the tent up. See what I mean if you skip the quarry? I reckon you’d finish within 2 hours. Without anyone around, I had the place to myself to put up the tent. Picking a spot that caught the afternoon sun, I managed to dry it out. Little River is great little camp area as well. Well, that’s the official Day One over and one with. Coming up would be the longest of the three days. Should I get up early for it? No, I’d sleep in. Again. I really like grass trees so you had me hooked with the first picture. The ones on your walk are a species I don’t really see much up here. I’ll get all “scientific” and say yours are shaggier and cuddlier looking with that thick dead section under the green top. Phytophthora cinnamomi is a worry. We’ve got it in Queensland too but I don’t think it’s spread as much. 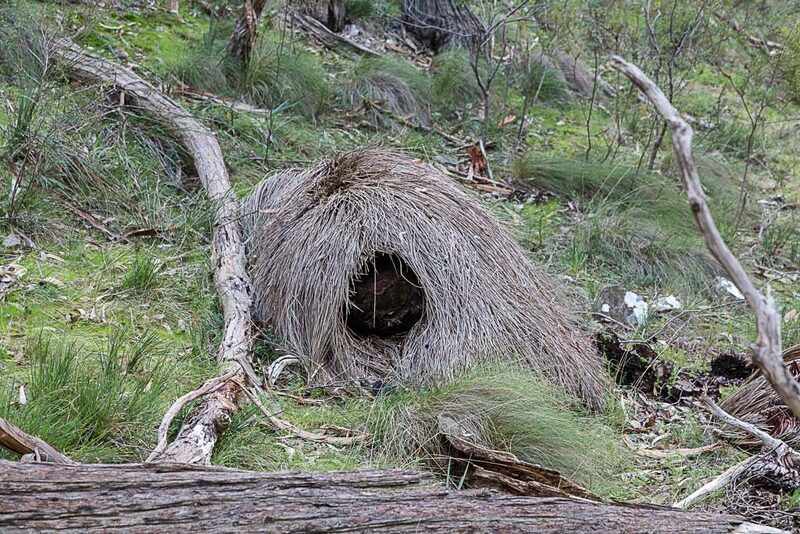 Mm… I thought all grass trees look the same…?! 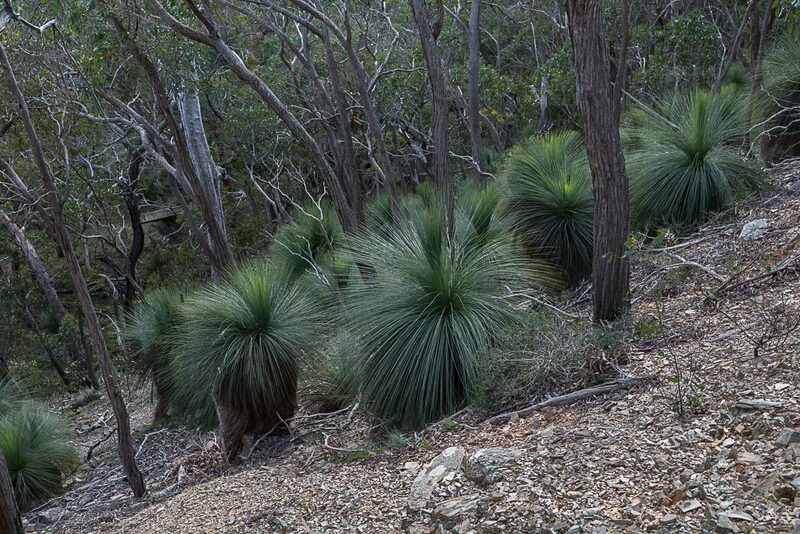 Then again, I’ve done absolutely no grass tree research. That fungus is everywhere now. 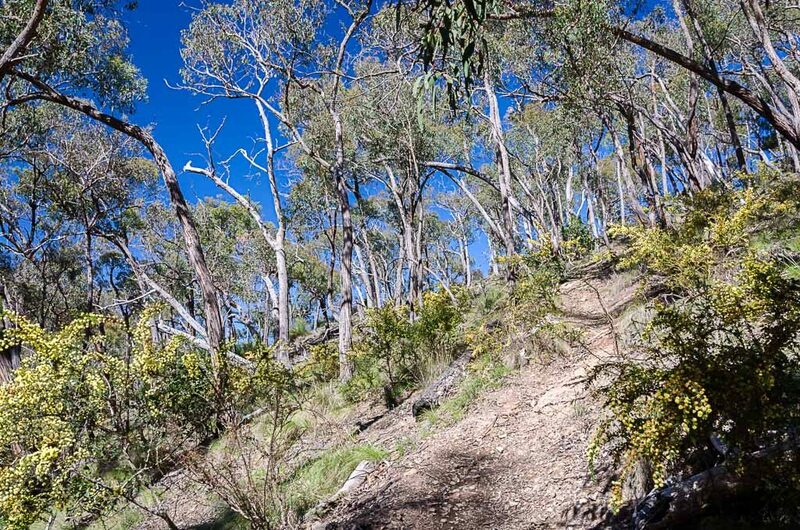 Otways, Grampians. They have boot cleaning spots at other locations, but I didn’t see any in the Brisbane Ranges. Budget cuts I guess! Phytophthora cinnamomi does seem to be everywhere. https://www.flickr.com/photos/kjbeath/219034767 are the most impressive grass trees I’ve seen. Could you have walked the road and the first leg in one day?